Hunter Community Legal Centre have secured almost $50,000 funding for the Hunter Youth Law Service in the latest round of the NSW Law & Justice Foundation’s grants program, exciting news for the centre. This project will trial and evaluate the provision of a youth lawyer from Hunter CLC at Hunter Valley Children’s Courts on criminal list days, to provide civil and family law advice and assistance to young people waiting for their criminal matters to be called. 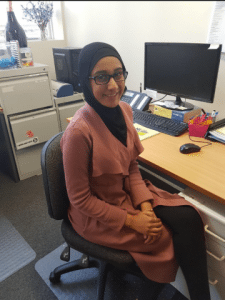 Toobah Choudhari (pictured) will attend Childrens’ Courts in the Hunter Valley to provide civil and family law advice to young people who are waiting for their other matters to be called. “This new service will allow us to provide better access to justice for young people in the Hunter Region, Hunter Commmunity Legal Centre Managing Solicitor Bronwyn Ambrogetti said. The idea for the service evolved from discussions with the Hunter Childrens’ Court Magistrate about the range of legal needs of the young people appearing in her court. It is hoped that having a civil lawyer available at the court will be a way to overcome the barriers to young people seeking assistance with their civil and family law problems. The team at Hunter Community Legal Centre hope that young people between the ages of 15 and 24 will take advantage of this new service in the Hunter Region.